Maximize Energy Savings with ENVI! Every month you get your bill and have no way of knowing why it is what it is. 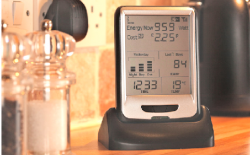 Take control of your energy usage with the Envi. Envi is the next generation in energy monitoring, helping users to understand their energy usage and more importantly their wastage. Empowering individuals with real time information, the Envi can influence changes in energy awareness and habits, reduce energy bills and improve Carbon Footprints. Add to your Current Cost network with this second generation monitor. And studies show that when you have the ability to monitor your electric usage and get immediate feedback of your actions on an easy to read display, you can save as much as 15% on your electricity usage. The Envi system is now a 2nd generation energy saving component that is super affordable and brings the future of technology into your home today, ie. An optional USB cable connects the Envi display to your own home computer or laptop. The Envi will export both current and historical data to your computer. There are various third party software programs available that will collect and interpret the data which can then be viewed in charts and graphs, e.g. Google's 3rd party software for the Envi. See real time energy usage around your home. View whole of house usage and use the data to cut back on energy with a targeted goal. 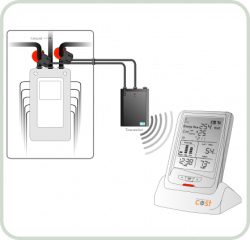 Monitor individual appliances (IAM plug required and available per each appliance in your home). Identify those energy hungry appliances. Start changing your energy habits and save money immediately. Cut your carbon emissions and contribute to a more sustainable future. C2 communication technology provides interoperability with the existing and future Current Cost product range. And because every home is unique, the Envi system offers multiple options to fit your personal level and monitoring goals. Ask us about the SPECIAL Google PowerMeter Package which brings both the ease of using your home computer with Google's power-meter tool online!